Book a skilled leaf removal expert in Augusta. Backed by a total satisfaction guarantee and amazing customer support. 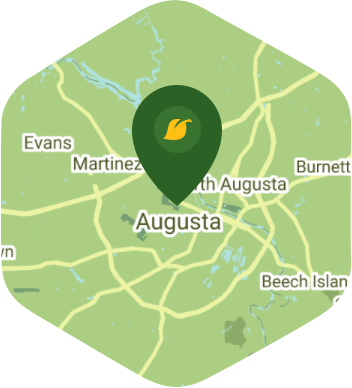 Living in Augusta means you are right at the home of the Masters Golf Tournament, one of the most celebrated professional golfing events in the world. However, you know that golf isn't the only thing that your city has to offer. You have a lot of beautiful parks, great museums, a fancy Riverwalk, and the childhood home of former President Woodrow Wilson. This city has plenty of history, culture and nature. Speaking of nature, the leaves on your property might be starting to wreak a little havoc on your lawn, but you probably wouldn't want to waste your weekend doing leaf removal. Forget that! Just leave the leaf removal to Lawn Love because it is something that we would be more than happy to do for you. We know how rough it can be for your lawn whenever autumn rolls around because of how quickly the leaves tend to get shed by your trees. Yes, the dead leaves make for a great, picturesque scene, but they can actually do more harm than good. You need to have them cleaned up right away because they can suffocate your lawn, and no one does leaf removal better than Lawn Love. Let us handle this task for you. Call us at 706-250-4429, or ask for a free online quote. Average lawn size 7,653 sq. ft.